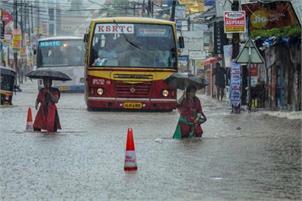 Heavy rains in Kerala takes away 20 lives on Thursday with heavy destruction in the southern states. Due to the rise pf water level in various dams and reaching the maximum point least 22 reservoirs in the state have been opened to drain out excess water. 11 people were killed in a massive landslide in high range Idukki region , 6 in Malappuram district, 2 in Kannur and 1 in Wayanad district since wednesday night. In Idukki's Adimali town 5 members of the same family died. 2 people were pulled out alive from the debris by the locals. In the last 26 years, a shutter of the Cheruthoni dam of the Idukki reservoir, considered the biggest arch dam in Asia, was opened by afternnon on Thrusday with the water level touching 2,398.98 ft. The full reservoir level (FRL) of the dam is 2,403 ft.
Four shutters of the Idamalayar dam in Kochi district were opened on Thrusday morning and people living in the banks of Periyar river and its other tributaries were asked to be vigilant as the released water was likely to inundate low-lying areas. The government has warned and asked tourists not to go to high range areas and dam sites. Chief Minister Pinarayi Vijayan said the flood situation in the state was "very grim" and it was for the first time in the history of the state that 22 dams have been opened at a time following the water level reaching its maximum capacity. The annual Nehru Trophy boat race has been postponedue to floods. Earlier it was going to be held on August 11 at Puunamada Lake in the district of Alappuzha. "There is a possibility of water level increasing in Kuttanad in the district in the event of the Kakki reservoir lifting shutters. So, the boat race has been postponed. The new date will be announced later," the CM added. An assistance of Army, Navy and Coast Guard has been sought and six more columns of National Disaster Response Force (NDRF) had been requested to be deployed in the flood-hit areas. In the areas of Wayanad district Navy helicopter has been deployed to rescue thos who are in danger. A 24x7 monitoring cell has been set up at the Secretariat to coordinate the relief works with various district collectors. A meeting of the CM and the Members of the central team was held on Thursday morning. In the Idukki, Kollam and other districts of the state education institutions have declared a holiday.